Your DSL internet connection is too slow? Want to set up an improvised office? You do not want to pay for a DSL internet plan when you already have a fast 4G mobile plan? If yes to one of the above, it is quite easy to configure a Raspberry Pi to share one mobile internet connection to an Ethernet network. Strictly speaking, you don’t have to use a Raspberry Pi to do this. A laptop or desktop computer with any Operating System would work too, but the Raspberry is so small and consumes only 2-3 W of electrical power, and is so cool (quite literally! ), so will will make use of this awesomeness! We will not focus on the Raspbian OS nor on any other distribution, because documentation for these other setups exists in abundance. You should not have a graphical interface installed. GUIs also install the NetworkManager service for systemd (Debian package “network-manager”), and I have not tested how NetworkManager interacts with the methods presented below. In addition, a bare-bone system is the preferred choice because it saves RAM and CPU resources. In any case, you should attach a keyboard and screen to the Raspberry because you may temporarily lose network connectivity during the setup. You also need a smart phone with an internet plan, supporting USB tethering. I have only tested recent Android based smartphones. Keep in mind during the following steps that, with most smart phones, you need to re-enable USB tethering after reboots or USB cable reconnects. Computers in the LAN will be able to set the Raspberry Pi’s static IP address as internet Gateway and DNS server. 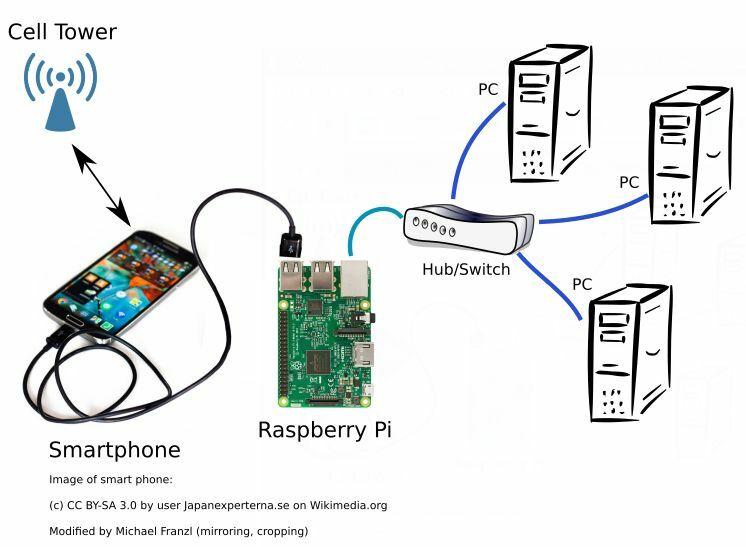 The Raspberry Pi will prefer a smart phone connection (tethered USB) to forward traffic. This ensures that cached DNS lookups are very fast when a DNS query has already been fetched. If you already have a DHCP server running in your local network (we will use the subnet 192.168.0.0 in this guide), give the Raspberry Pi a free static IP address in this existing subnet, e.g. 192.168.0.250. If you don’t have an existing DHCP server running in your local network, we will set one up on the Raspberry (see Step 8 below). The large positive integer value of “Metric” ensures that other configured gateways with a lower Metric will be preferred. This will come in handy in the next step where the smart phone will be our preferred gateway with a Metric value of 1024. Now reboot the Raspberry or run systemctl restart systemd-networkd. You may lose network connectivity at this point if you are logged in via ssh. Plug in your phone’s USB cable into one of the Raspberry’s USB connectors. Then turn on USB tethering in the Settings UI of your smart phone. Run networkctl. You should see the following entry amongst the other network connections (notice “off” and “unmanaged”). You also can check networkctl status usb0 to see the dynamic IP address obtained from the DHCP server on the smart phone. For Android phones this is usually in the subnet 42. Note that the response came from the phone’s IP. So, “systemd” has correctly configured the phone’s IP address as DNS server for the Raspberry (that information came from the phone’s DHCP server). Note that this time, the response came from the “bind” DNS server which we have installed in Step 1. It, in turn, forwards queries via the phone connection. This server will be used for all requests via Ethernet. Reload all settings by typing sysctl --system. Now, and also after a reboot, the “ip_forward” variable should stay enabled. This will masquerade IP packets coming in through the Ethernet adapter as if they were coming from the Raspberry itself, forward them to the USB smart phone connection, and the incoming answers (from remote servers) will be re-written and forwarded back to whereever in the LAN they came from. That is the central purpose of the problem we’re trying to solve in this tutorial. Step 7: Test the Raspberry Gateway! The route is correctly resolved. First traffic goes to the Raspberry Pi, then to the smart phone, and from there to the internet. If you can’t run traceroute on that other machine, using a regular browser to browse the internet should work at this point! This tutorial may seem long, but the commands are few, and with a bit of practice you can turn your Raspberry Pi into a mobile phone Gateway in 10 minutes to enjoy faster 4G internet when your other modems are too slow. This is the exact setup I wanted, only including Pi-Hole. That made things slightly different, but got everything working now. Very happy. Being an absolute novice to the raspberry’s I would never have succeeded without this article. Many Thanks! Great Tutorial. I will test it very soon, but a little question! If I would like for example use 2 USB devices because of the limitations of one of the connections. The device I do not need at this time simply has a limited data plan until feb 2019, so why not use it :-). What I would like to accomplish is connection A to be permanent and connection B is flexible, but when this connection is connected data should primarily use connection B . I am aware of the fact that tethering then must be reactivated on the mobile device. Is there a simple solution as you know? I don’t know, but I would guess that you have to look into network load balancing. So taking internet to the modem (with Ethernet to RPi) and distributing it with a USB tethering (RPi to a tablet or something else)? Hi; I’m Giorgio, I’m writing from Italy. Thank you for your work, it was wery useful for me. The is ont thing I can’t understand: in my LAN I have a DLink modem/router distributing Internet via a wireless internet provider (antenna). I’m trying to use your guide to use a mobile phone to give internet to all my devices. Well, but what happens to the devices connected to the LAN via wireless? In which way the wireless access point can route the traffic to the Rpi/mobile phone? Hi ! Thank you for your instructions. Just need to know how i can create port forward rules with this type of network configuration. Do you know if this would work on a Pi 1 ? I don’t know unfortunately. You will have to experiment. If you don’t have a purpose, your life becomes characterized by unbearable suffering. You need to set a noble purpose against this suffering. If you provide people with nobility of purpose, then they can tolerate the suffering of existence without being entirely corrupted by it. Cultures that don’t do that are dead, they’re done, and everyone suffers stupidly as a consequence.